Cats, especially brachycephalic cats have adorable personalities and calm character. This is something that makes them popular among the other pets. However, medical issues with brachycephalic cats make them require special care and attention. Brachycephalic cats are easily recognizable as some of the characteristic features are short muzzles, smushed face and protruding eyes. In recent years, more and more brachycephalic cats have been bred and the trend has been slightly inclined towards attempts to make their face flatter. Experts believe that this has been the result of ambitious attempts to create unique looking pets. Brachycephalic cats, due to their smushed face and narrow nostrils are vulnerable to breathing problems. The condition is not the same in all the brachycephalic cats, however, when it starts to become the biggest concern, it is known as brachycephalic airway syndrome. With narrow nostrils and abnormally larger soft palate, most of the cats belonging to this breed face the respiratory hardship. As a matter of fact, these cats, if they face a respiratory infection, even continuous nasal discharge could clog their narrow nostrils, forcing them to breathe through their mouth. 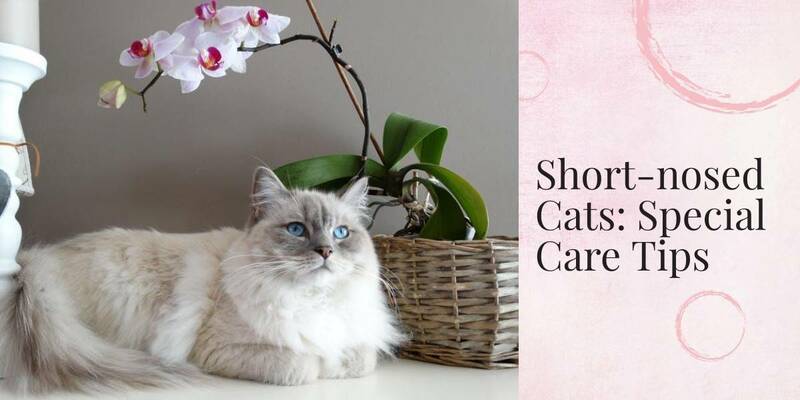 To handle the breathing issues in brachycephalic cats, it is highly recommended that keep a close eye on your feline, especially during summer or hot and humid conditions. It is ideal to take them to a veterinarian in case of issues like labored breathing or heavy snoring, which seems to be increasing. Difficulty to breathe after engaging in physical activities like playing or running. Brachycephalic cats, with the breathing difficulties, are likely to engage in less physical activities compared to other breeds. This makes them vulnerable to become obese. Becoming obesity increases the difficulty to breathe. This is why it is recommended that your plan special diet for your brachycephalic cat and cater them in special bowls. Brachycephalic cats are also known to have eye anomalies. The inward rolling eeyelidscan cause one of the common issues by scratching the eyeball. Surgery is an ideal option to bring this issue under control. Tear staining is another issue with the brachycephalic cats. The tear duct problem causes constant wet eyes and dark streaks around the eyes. This can lead to bacterial formation if left unattended for too long. Surgery cannot fix the tear duct anomaly; the ideal means to tackle the issue is to cleaning their eyes on a daily basis. Experts believe that it is best not to use any antibiotics or other creams to clean the tear stains. Bulging eyes is another issue with these cats, which is why it is highly recommended not to engage them in extreme physical activities like running or intense playing. The smashed fact offers less space to accommodate all the facial features, which in turns leads to a crammed teeth arrangement in brachycephalic cats. This leads to cooked and overlapping teeth with additional oral issues. Home dental care initiative like brushing on daily basis, nutritious diet and 6 months veterinary check is a necessity to alleviate all the dental issue in brachycephalic cats. Brachycephalic dogs are special in many ways, setting aside some time to take care of them is given. Understand this if you are planning to own a brachycephalic cat.